I sleep well in the night if I know what's for breakfast the next day.Not necessarily ready to eat stuff,but things like vegetables chopped for masala dosa,freshly ground dosa batter and grated coconut for chutney.Or even ideas for breakfast.But there are days when I am left staring inside the fridge,scratching my head for breakfast ideas.On those days,I turn to bread. We are not a bread-omelette eating family.I don't eat eggs and Ajay is not a big fan of eggs,so bread breakfast mostly means toasted bread with butter and jam along with oats or cereals.Bread usli is saved for tea time.When last time in-laws were here,ma-in-law made this delicious bread upkari which tasted very similar to upma and which was so good on its own.Perfect breakfast in 15 minutes! Chop the bread slices into small pieces. In a thick bottomed kadai add oil and splutter mustard seeds. Mix in the green chilly,red chilly and curry leaves. Add in the sliced onions and saute till they turn golden brown. Meanwhile mix together curds,sugar and salt. Add in the grated coconut followed with the curd mix.Mix in the bread slices and cook till the bread cubes turn golden brown and crisp. Update - Adding curd to the Bread Upma is a unique idea of my ma-in-law.She started making this upma with wheat bread.As it is,wheat bread becomes hard and chewy when it is stale,adding curd makes it soft.I follow the same method for white bread too which makes the bread soft on the inside and crisp on the outside. looks super yummy!.....dint know we add yoghurt to uppuma........nice! i love the backdrop ! Adding curd is new to me...I agree with you planning makes it so easy next morning..
Wat an irresistible and very interesting upkari. You are like my sis , she too always like to know what she is going to give for breakfast. This bread umpa looks so good. WHen i was younger and living at home bread was rarley there for breakfast and when we had it was when mom was not feeling good ir very busy. I use a Bajaj F10 food processor.I love it.I use it for kneading chapathi/bread dough,grating carrots/beetroot/cheese mainly.It has a mixie attachment too. 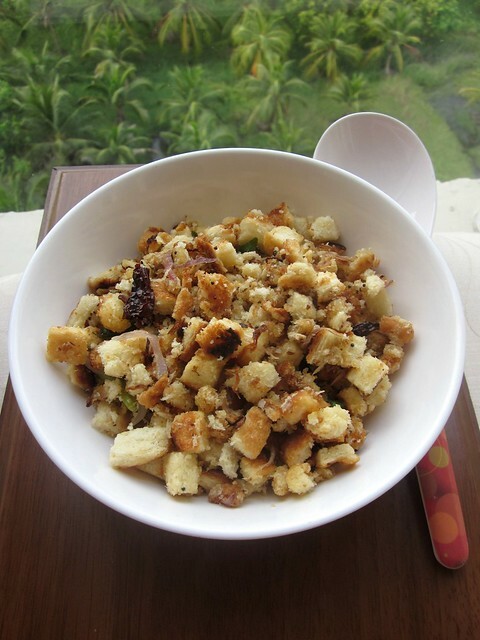 Fantastic bread upma,looks highly inviting. Wish i could grab that bowl now.....looks so tempting! !